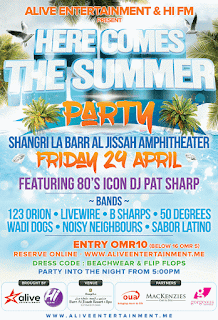 Tomorrow afternoon the beach party, Here Comes The Summer, with Pat Sharp and 7 local bands kicks off at 5pm. Tickets are RO 10 and you can still buy them on the door.. However, for Mohammed, he can go for free with a friend because he won the free pair of tickets I was giving away.